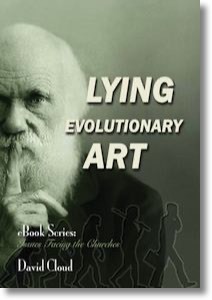 This book examines major icons that are used in science textbooks and museums as evidence for evolution, proving that they are built on scientific inaccuracies and outright lies. Some of the research was done in major natural history museums such as the Chicago Field Museum, the American Museum of Natural History, the Smithsonian Museum of Natural History, the Yale Peabody Museum, the Australia Museum in Sydney, the Burke Museum of Natural History, the Museum of Man in San Diego, the Erasmus Darwin House in England, and the British Museum of Natural History. The icons examined are Haeckel’s embryo chart, Haeckel’s dumb apeman, Piltdown man, Nebraska man, Neanderthal, the Horse series, Archaeopteryx, the wolf-whale, the peppered moth, Lucy the ape woman, the Laetoli footprints, and the Scopes Trial.